Cuba’s population is to be offered internet access via a 3G mobile network from later this week. Telecom provider Etecsa said citizens would be able to start subscribing to the service from Thursday. Until now, locals have mostly relied on wi-fi hotspots and internet cafes and the 3G service has been restricted to state-employed journalists and foreign businesses among others. This will change – but many will still be unable to afford the new contracts. Etecsa’s packages range from a month’s use of 600MB of data for 7CUC ($7; £5.50) to 4GB for 30CUC. Users get a bonus 300MB use of local .cu domain websites. But the average state wage for the island’s 11.2 million residents is the equivalent of about $30 per month. The launch marks a further relaxation of the government’s restrictions on online activity. Until five years ago, access was largely limited to tourist hotels and state-operated clubs. But in 2013, the authorities began opening internet cafes. In 2014, they began allowing mobile phone owners access to the state’s Nauta email service at a charge of 1CUC per megabyte – the price has since fallen to the same charge for 50MB. In 2015, the first wi-fi hotspot opened at a cultural centre. Hundreds of other public spaces then followed. And then in 2017, Etecsa began offering a limited number of home connections. Access to the new 3G service will be rolled out over a three-day period in order to reduce the risk of it being overwhelmed with demand. The order in which existing subscribers will be invited to join will be determined by the first two digits of their mobile phone number. However, Etecsa has not ruled out the possibility of glitches. “Incidents could be experienced in certain areas,” it has warned. Nearly half of Cuba’s population own a mobile phone although not all are compatible with the radio frequency the service will use. Cubans have long wanted to catch up with the rest of the world when it comes to internet access. 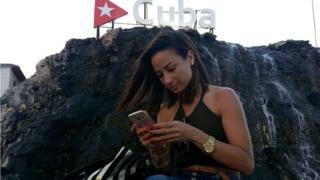 Since Raul Castro stood down and was replaced as president by Miguel Diaz-Canel, that has looked increasingly likely – at least on their mobile phones. The new president has an active Twitter account and several members of the Council of State followed his lead recently. Still, based on their experience, most Cubans are distrustful of major announcements and unveilings until they can see real change for themselves. The last time a 24-hour pilot for 3G was run, for example, other mobile services such as SMS messaging went down. They will want to see that mobile internet works well and is dependable before deciding whether they can afford the packages. Still the desire is there, especially among young people who never considered it fair that they lagged so far behind their cousins elsewhere in the world. One electrical engineer told me he was exhausted with having to sit in hot public squares to get online. “Why did we have to be the offline island?” he said. To date, Cuba has generally allowed users to interact with most of the internet if they could gain access. A report by the US think tank Freedom House last year noted that the US government-backed news site Marti Noticias and local blog 14ymedio were blocked. However, it added that foreign news sites – including the BBC and Spain’s El Pais – were available, as were social networks including Facebook and Twitter. Citizens can also use video chat services that allow them to keep in touch with family members who have emigrated abroad.